This has been quite a year for lawsuits in the trading card industry. In just a few months I've written articles on just about all of them. Upper Deck, Panini, Leaf, Blowout Cards, Topps, and others have sued, been sued or both. And there's still a few months left to go in the year. But these pieces covered suits already filed. Now, let me throw out the chance for another potential lawsuit that could be filed before the end of 2011. 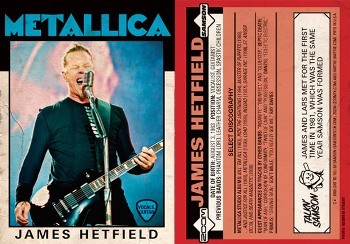 Now, I grew up in the 1980s, collected the 1986 Topps Baseball set and rocked out to Metallica and Anthrax (though, truth be told, I was not a fan of Megadeth and only recently learned to like Slayer). I went out today and purchased my first ever Revolver magazine with all 18 cards. I figured these cards would be a good addition to my personal collection of “Cards that Inspired (or Could Have) Inspired Lawsuits." The reason for the potential for trouble: the cards use the 1986 Topps Baseball design. I do not see anywhere on them that says Topps approved or licensed these cards. Now, if Topps granted Revolver a license, then there's no problem and I should focus on writing about real lawsuits. If, however, Revolver did not get permission from Topps, then expect a copyright infringement and trade dress lawsuit in the very near future. Also, since these cards are currently available on the market, Topps may seek a temporary restraining order or preliminary injunction to try to yank the cards off the market immediately. From a lawyer's perspective, any such actions would be a good show. Unlike the Topps vs. Leaf lawsuit, this one would be a slam dunk for Topps. All Topps needs to show to prove copyright infringement is access and copying of the card design. Revolver does just that by admitting the 18 cards are based off 1986 Topps Baseball. This lawsuit is reminiscent of the Topps vs. Upper Deck lawsuit over the O-Pee-Chee design. While that suit settled confidentially, it already gave Topps the practice it needs to quickly bring such a suit in this case. Should a suit be filed, the only defense I can see that Revolver may have is that it could argue card designs (as compared to actual cards with player photos and statistics) should not be protected by copyright. I don't think such a defense would succeed because there were artistic decisions made in designing the 1986 cards and the 1986 set looks quite a bit different from just about every other baseball card set the company has made. Whatever happens, I'm glad to say I own these cards. I mean, whether there is a lawsuit over them, or if they just remind me of a time when my hair was way-too-long, they truly do rock.